Cellar Pottery bowl - 1 - 6½" (165 mm) diameter. 1960 - 67. 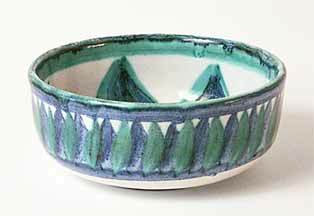 Cellar Pottery was established by French-born Christiane Richards at Island Square, St Ives, Cornwall, in 1960. Christiane is the wife of Anthony Richards who at that time was running Arch Pottery nearby at The Digey. Christiane decorated red earthenware blanks bought from Brannam's or sometimes thrown by Anthony. She marked them with a distinctive St Ives brushed in black with a very large initial 'S'. Cellar Pottery closed in 1967 when the couple opened Penderleath Pottery at Cripplesease on the St Ives/Penzance Road, the B3311. Christiane is now doing very similar decorative work with Anthony at Countrylane Pottery.